Undoubtedly, all car owners need a garage. Of course, you can temporarily leave the car under a canopy, but this is not an option, because a canopy is unlikely to protect your “iron horse” from the vagaries of the weather. A garage is a “home” for your car and a guarantee that getting up in the morning and leaving the house you will find it safe and sound. The garage should be spacious and equipped so that it can carry out repairs and maintenance of the car, comfortable and warm, serving as protection from inclement weather. Built into a house is the most expensive and labor intensive to build. 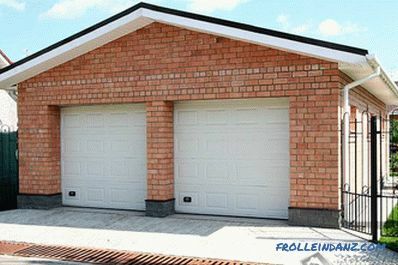 garages, so they are built together with the house. However, their convenience lies in the fact that they can be reached without leaving the house, moreover, they do not occupy a separate place and are heated like the whole house, which does not require additional installation of communications. The attached garage is also very convenient to use. It is also heated with the house, having a common water and power supply system with it. But unlike the built-in garage of this type takes up additional space. The third type of garage is separate from the house. They require the laying of communications: electricity, heating and additional space. It is better to have them closer to the place of exit from the site, so as not to lay additional access roads. 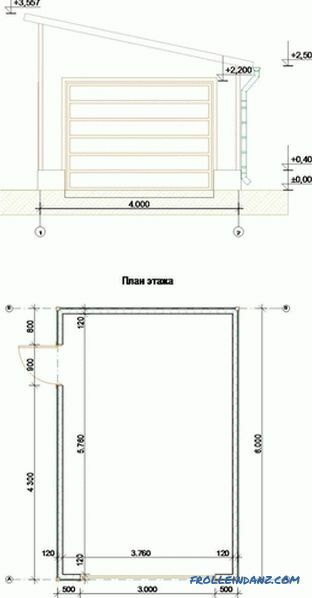 One of the options is the location of the garage at the building level of the plot, that is, in one line with the fence, thus, the garage door will go straight out onto the street. 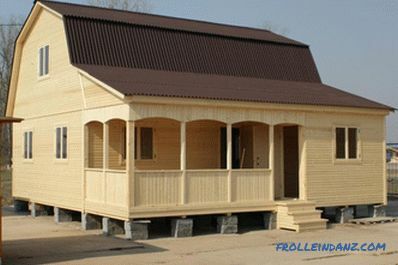 How to build a garage with your own hands? Select the building site should be in accordance with the building regulations. If you build a garage flush with the fence, then its open gates should not interfere with the movement on the roadway. 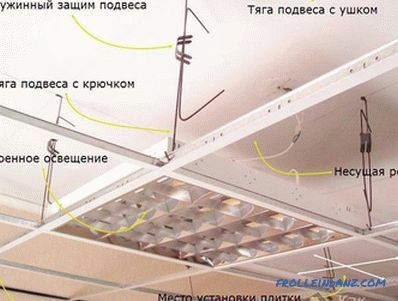 For fire safety, the distance from the garage to the nearest residential building should not be less than 9 meters, or 15 meters, if this house is covered with polymeric materials. According to the law, the building should be located at a distance of at least 1 meter from the neighboring site, and the entrance to it should be no closer than 10 meters from the windows of the neighboring building. 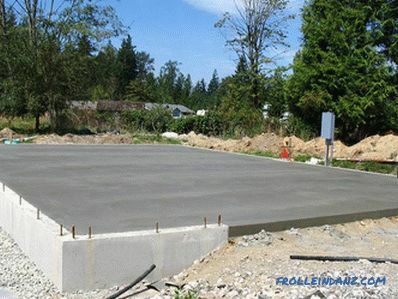 Foundation installation For a detached garage, a foundation is laid. 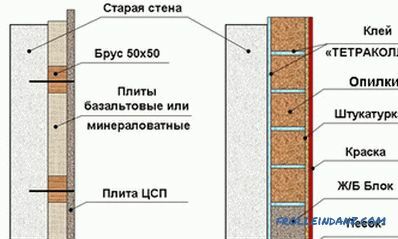 The depth of the foundation is chosen from 50 to 70 cm, depending on the soil - sandy or clay, respectively, but in any case - below the freezing point. Most often, garages are built on a strip foundation for which a trench is being dug. 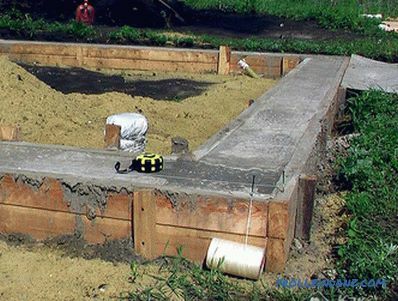 For hard ground, formwork is set only for the above-ground part of the foundation. 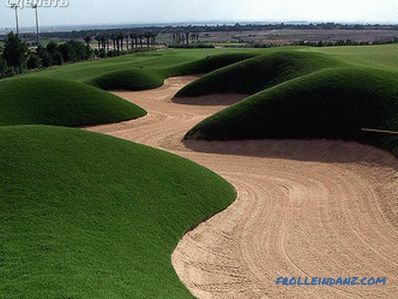 Its underground part is made by pouring concrete directly into a trench with preliminary reinforcement. As for the walls, different materials can be used for them - brick, blocks, solid concrete, decking, sandwich panels, etc. If the walls are built of brick, then laying is done in one brick. Plaster walls in this case need on both sides - inside and out. After plastering, a topcoat is applied, which is used as a facing tile or exterior paint. Both of these materials are well tolerated by moisture. From the design considerations, it is recommended to do the exterior finish the same as the one that was used for the house and other buildings on the site. 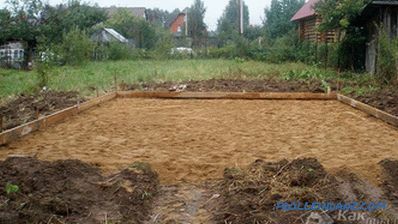 Immediately after laying the foundation, even before the walls are raised, a floor is made in the garage. For a concrete floor, the garage area is compacted with sand, a layer of which is 10 centimeters, while it is necessary to withstand a slope of 2-3 degrees in the direction of the garage door so that the water inside can freely flow out of it. After sand filling, a waterproofing material is laid, for this you can use a simple roofing material, on top of which a concrete screed 15 cm thick is poured. 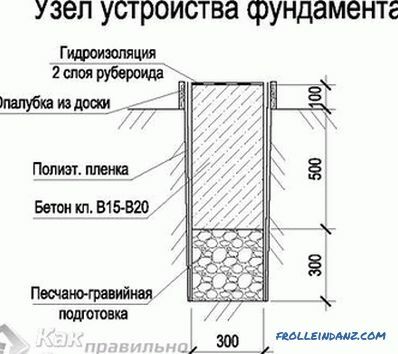 Concrete grade should be at least M300. It is not necessary to use concrete for the floor, you can also do with a cement screed. To do this, mixed large and small crushed stone is poured onto the site and is well compacted, after which it is poured with a layer of cement mortar in two stages. The first layer is filled with a thickness of 4-5cm. A few days later, a second, more liquid mortar with a thickness of 2-3 cm is poured. Now self-leveling self-leveling mixes for the floor are widely used in construction.This relatively new material can also be used as a second layer. In the cement floor you need to install a grate for water flow. For fire safety purposes, it is desirable to cover the floor with special paint or ceramic tiles. Before painting or finishing the concrete floor is treated with a primer, which protects it from dust and prevents the formation of cracks. Apply these materials on a clean, dry and level surface. The flat roof is made of a floor panel, and the dual-slope roof is fixed on the rafters that rest on the walls of the garage. With the dual sloped roof, a crate is stuffed on the rafters, over which the waterproofing material spreads and the roof is laid. 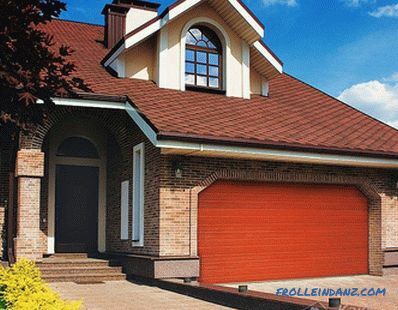 For this, any roofing materials can be chosen, the most effective of which is metal tile and corrugated flooring.